It's easy to change up a carton of plain eggnog into a specialty eggnogg with the simple addition of peppermint extract and a garnish of crushed peppermint candy and whipped cream. 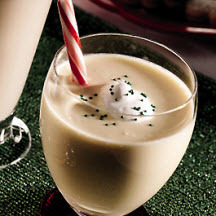 Combine eggnog and peppermint extract. Garnish with whipped cream and crushed peppermint candy.